I had the opportunity recently to participate in branding a new small business in my hometown of Albuquerque. 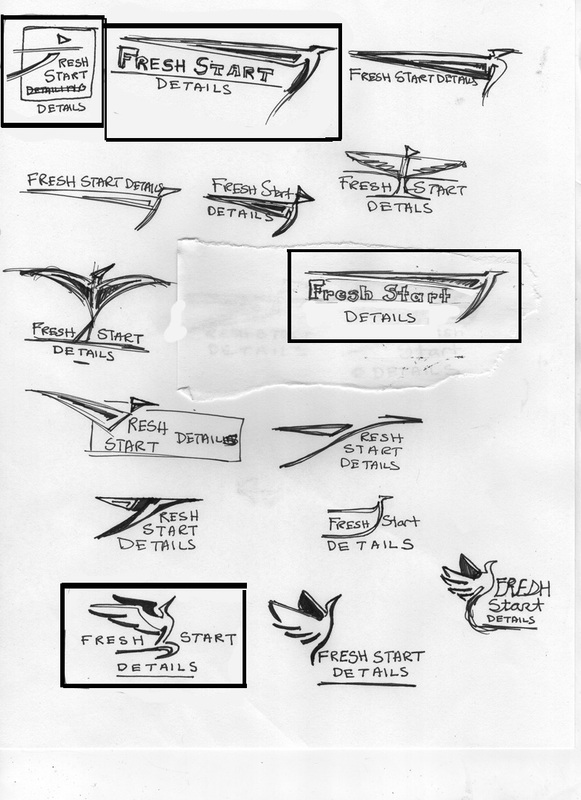 Fresh Start Detailing is a woman-owned car detailing business run by a great lady named Marcie. Marcie wanted to use a phoenix as her symbol and integrate the idea of a hood ornament into the logo. First we went through some rough sketches and she picked the ones that were moving in the right direction. Then we moved onto the second draft to solidify that bird. I realized later that in option one I was unconsciously mimicking the USPS eagle. Happily she liked option #2. In the third draft I minimized the bird's more extraneous elements and added a color (for the web version) at Marcie's request. The next step was to add fonts that I had purchased from the very reasonably priced Font Diner. We chose a pair of retro fonts that merged with her classic car aesthetic. Once Marcie was happy with her logo I made versions for all her social media platforms, business cards, and even the outdoor sign in front of the store. Often image creation is less challenging than the preparation of files for the variety of requirements and constraints by various printers and media formatting engines. In the end Marcie was happy with her logo in all it's forms, so I can now enjoy post-project satisfaction...for ten seconds. This is the maximum allotment of happiness my crippling self-doubt will allow per project. In any case, Fresh Start Detailing will be open to the public this Fall and I highly suggest you take advantage of her affordable prices and excellent work if your ride resides in ABQ.